Should I take up coaching classes or study at home? If I choose the latter, will I be able to crack the exam? Well, these are the two primary questions every IAS aspirant would have initially. People who have attempted the exams and weren’t able to rope in good scores do have the same issue as well. There are like a ton of reasons why choosing coaching classes is always a safer idea. Getting to the facts, Elite IAS is one of the very few top-notch IAS coaching centers providing the best IAS coaching in India in our country. How? Let’s see. If you are an IAS aspirant looking for proper IAS Coaching, you already know how useful it is to have some experienced people to support you with the preparation. That’s what Elite is all about. Every instructor here has attempted the exams more than twice and have been constantly analyzing the exam patterns of every year. This means you can simply have them prepare the study schedule for you, complete the test series, work on the feedback provided and crack the exam – as simple as that. Now, we all know General Studies is not an easy deal to crack. Elite IAS provides an Integrated GS Course for the Classroom Programme students. Starting from the discussions to weekend tests, this course is determined to lift up the scores. After the completion of the regular course, the excellent students are taken to the Advance level, wherein they will write the All India Test Series, assessing their scores and skills in a PAN India-level. Apart from this, the students can choose from the GS Mains + Prelims the only course, Optional Paper coaching, Prelims only or Mains only course as well. 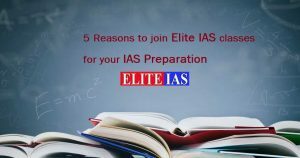 Being one of the providers of the best IAS coaching in India, Elite IAS is located in Delhi and has students from all over the nation. They were able to gain students from PAN India due to their equal attention to both classroom and online IAS Coaching. The team believes that equal preparation support must be provided to all their IAS aspirants. Most online learners have also approved of the same with their results. Considering the value the UPSC exams hold, most institutes charge a high fee for IAS Coaching. Here, at Elite, the focus is on the exams and preparation rather than the fees. Even if you opt for just the test series, you get access to all the relevant resources, Elite IAS students can avail. Elite IAS accepts students who are serious about the preparation. So, if you choose the classroom sessions, you are going to collaborate with experienced aspirants. This means you will be constantly motivated to work hard and harder. Just so you know, the lack of motivation is a factor most aspirants face as the preparations and exams are time-consuming processes. Apart from these, there are plenty of other reasons as to why you should choose Elite IAS. If you are looking for the best IAS coaching in India to crack the exam, Elite IAS is undeniably the best choice. In simple words, at Elite IAS, you are in the right place. How Many Hours of Study is Required For IAS Exam Preparation?